‘Peter Sutherland was an immensely gifted and principled man who, in an extraordinarily wide ranging career, made an outstanding contribution to public life not only in his native Ireland but also in Europe and indeed globally: to the world of business and also to the Catholic Church whose faithful, if not uncritical, servant he always remained. ‘As Bishops in England and Wales we are greatly indebted to Peter. He was a close adviser to my predecessor, Cardinal Cormac, and gave generously of his time and money in support of the Church’s work both in Ireland and the UK. 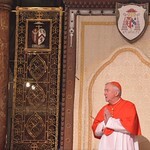 He was always willing to help the Church, whether in the local parish or assisting the Holy See more widely. His wisdom, shrewdness and passion for justice were a powerful combination, and he was a fearless and courageous public witness, not least in his work as the UN Secretary General’s special envoy on international migration. Peter Sutherland was the United Nations Special Representative of the Secretary General for International Migration from January 2006 to March 2017. In this role, he was responsible for the creation of the Global Forum on Migration and Development (GFMD). He served as President of the International Catholic Migration Commission, as well as member of the Migration Advisory Board of the International Organisation for Migration. He had previously served as Attorney General of Ireland (1981–84), European Commissioner responsible for Competition Policy (1985–89), founding Director General of the World Trade Organisation, and former Chairman of Goldman Sachs International (1995–2015).